Does the world really need another Valentine’s Day printable? The internet is full of heart themed activities for kids. Even I’m guilty of contributing to the pile of freebies out there. If you’re only looking for freebies, be sure to read to the end. If you’re looking for a complete fun pack of printable exercises that help strengthen your child’s learning power without a whine or complaint, I’ve got your covered. 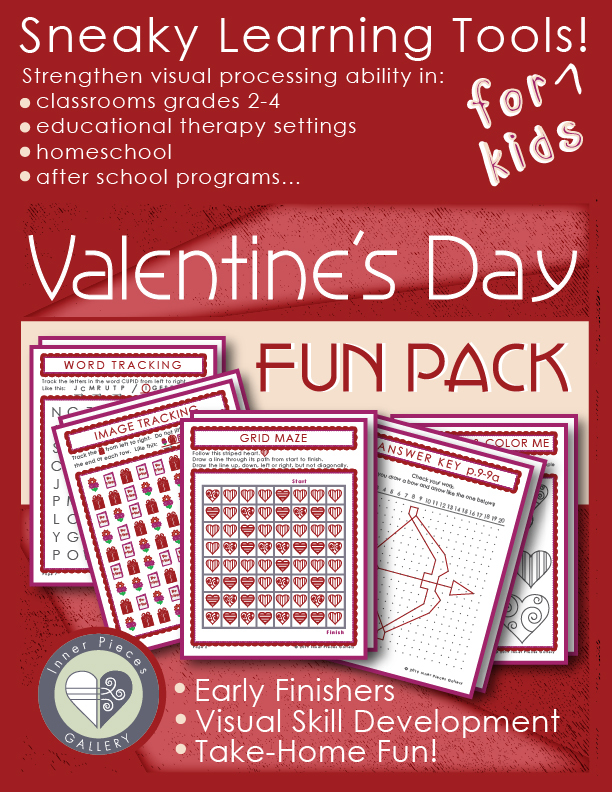 Introducing the Valentine’s Day Activity Fun Pack for kids. It’s one of those deceptively simple collections of activities that happen to strengthen visual skills, working memory, executive function, and more. You can even have a side serving of auditory memory skill-building if you’d like. Simply adapt the final pages a little (suggestions included). No, you don’t need to be an intervention specialist, a therapist, or even a teacher to introduce these fun pages to your kids. Simply print, read a few simple instructions, and enjoy! Tip: If you do NOT like printing activities for kids in full color, I don’t recommend the Valentine’s Day Activity Fun Pack for you. If you don’t mind spending a few extra pennies on ink, find more information about the Valentine’s Day Activity Fun Pack, as well as fun packs with different themes, below. They will each take you to a more thorough description of the products in my Teachers Pay Teachers store. Whichever activities you choose, Happy Valentine’s Day!